CUBA: So close it is almost a part of Florida, but ideologically a world away! My first Cuba experience was in 2000 with Pastors for Peace. This humanitarian trip was illegal by a US Government Treasury Ruling, but strangely not actually against the law. Federal agents watched us assemble the ambulances, school buses and medical supplies we were taking to Cuba, and then escorted us across the Mexican border and paid our toll. Even back then the Cuban travel embargo seemed more an inconvenience than an actuality. This first visit was during the country’s “Special Period” after the Soviets pulled their financial support and the Cuban economy went into survival mode. Times were hard, and people were encouraged to grow gardens in the strips of land between the sidewalk and the street. There was even a national hero who wrote, spoke and demonstrated to Cubans how to grow their own food. 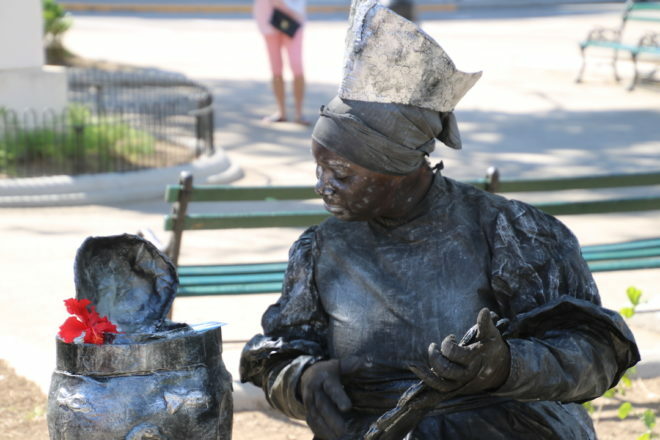 Gardening gained new importance in the Cuban culture. Subsequent trips exposed us to various agencies and aspects of central planning. We visited a “medical school” where doctors were being trained to be sent all over the world – this was thought provoking. Although these “doctors” may not qualify by U.S. standards, if you were a sick villager in some remote part of the world you would be very thankful for this Cuban “doctor.” Cuba also provided treatment free of cost to children from the Ukraine exposed to radiation from the Chernobyl explosion. Such stories inspired our family to request a visit last fall (2017). With all the negative hype in the press, we were apprehensive, but wanted to make the trip to allow our family to compare U.S. democracy to the realities of a totalitarian state first-hand. Our first stop was Trinidad, a colonial city in central Cuba which we had visited and enjoyed before. Arriving late in the evening, we were met by a local doctor who assigned our lodging. Dr. Alex earned commissions for organizing lodging at casa particulares (Spanish for “private houses”), private accommodations similar to a bed and breakfast. She also rented rooms in her home and hosted dinners. We learned that Cuban doctors earn a state salary of about $100.00 US per month – our dinner for 15 which she hosted paid Dr. Alex far more! This doctor had apparently given up medicine to become an entrepreneur. 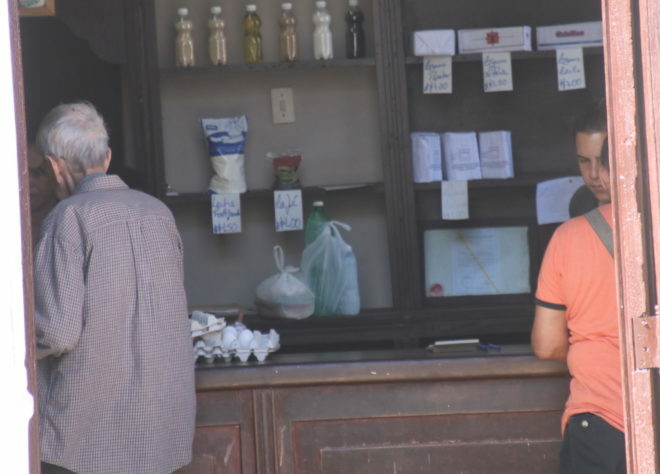 Cubans supplement their basic income through entrepreneurial ventures, such as selling produce on the streets. Due to recent adjustments to Cuba’s socialist model, people are now being allowed to purchase houses or apartments. We learned that family members often pool their money to purchase for their own multi-generational use or rent as casa particulares. This has caused a boom in interior remodeling for tourist rentals. Our small apartment in Havana was sparkling new and very clean. It is also now permissible for Cubans to travel abroad to purchase up to 250 kilos of goods annually to resell back home. Although cars are beyond the means of most Cubans, motor scooters are common prized possessions, often housed in the living room for secure display. From Trinidad, we took a trip on an old sugar train into the Valle de San Luis to tour the ruins of old sugar mills. This picturesque view of rural Cuba hasn’t seen much change, and people appeared to be very poor. Leaving the train at San Isidro we toured Mirador de la Loma del Puerto, an aging mansion that reflected the glory days of king sugar, complete with a 600’ tower to watch over the slaves. The Sierra del Escambray mountains and the Topes de Collantes reserve are also a short trip from Trinidad. Surprisingly, Topes de Collantes was the only area where we observed damage from hurricane Irma; many downed trees in the reserve. There are four small parks within the boundaries all with beautiful hiking trails. Topes is home to a large resort with an imposing medical facility for high government officials and military that was built by the Dictator Battista in the 1950s. We had an opportunity to visit the facility when our grandson had an attack of kidney stones. The doctors told him what was needed, but that they didn’t have the medicine to help. Not unusual in Cuba; first rate medical attention, but no medicine. This is the reason we bring a selection of over the counter drugs to leave at the local clinics. One afternoon was spent hiking in the mountains and down into a 1500’ deep gorge where we were treated to a beautiful waterfall and pool for swimming. Along the trail we passed several small farms and encountered the inhabitants’ subsistence lifestyle. 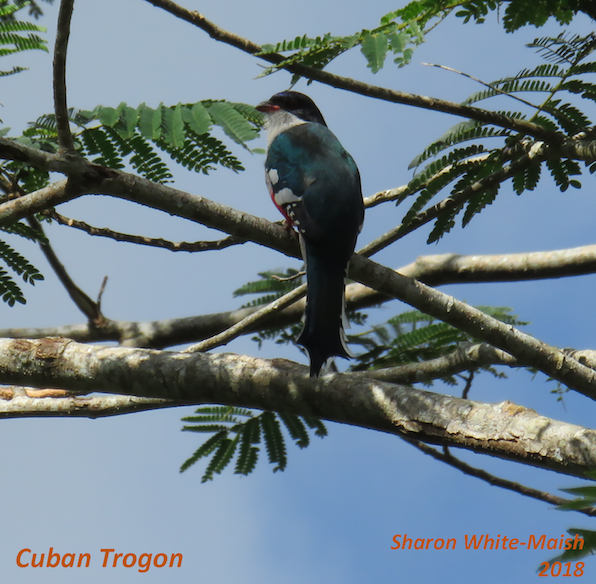 We also were fortunate to encounter a West Indian Woodpecker; Cuba’s national bird, the Cuban Trogan, a Cuban Tody, Emerald Humming Bird, Red Legged Thrush and a Cuban Bullfinch. Speaking of birds; the Cubans have a propensity to collect and cage wild birds. The folks at Halifax River Audubon learned of this and designed coloring books, in Spanish, of Cuba’s birds. We took several along as gifts for children. One would have thought Santa Claus made a return visit when we would give these books to local children with a box of crayons. 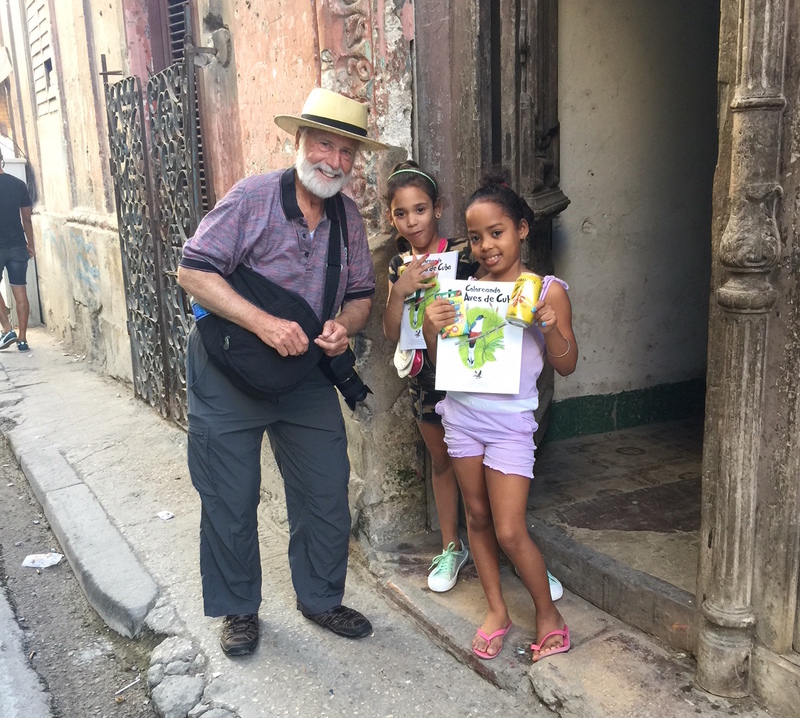 Tom’s family gave local children coloring books of Cuba’s birds in Spanish, designed by Halifax River Audubon. On to Cienfuegos, blessed with a beautiful bay and adorned with French-style architecture. We spent the afternoon people watching in Parque Jose Marti, the cultural center of the city. Around the park we found the beautiful old Teatro Tomas Terry (still very much in use), Museo Provincial de Cienfuegos (Cienfuegos Regional Museum) which is housed in an old Spanish Casino, Antiguo Ayuntamiento, a palace housing the provincial government, and the city’s oldest building, once residence of city founder Louis D’Clouet and now a souvenir shop. A quick look shows that Government Stores continue to focus on the basics, offering mainly household staples. 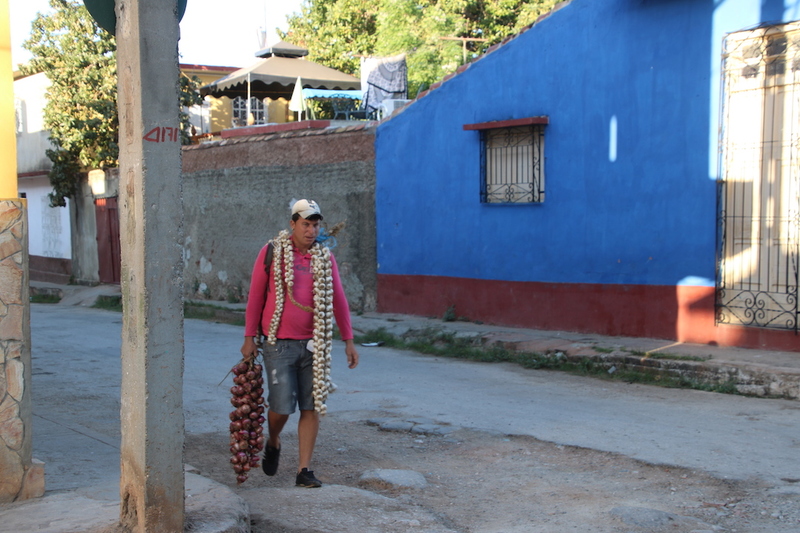 Along the avenue to the bay are many street vendors and craft shops that appeal to both locals and tourists. Here we looked inside one of the neighborhood subsidized food shops. A sparse selection; mostly rice, sugar, flour, eggs and other staples. The farmer’s market, on the other hand, offered an array of meats and vegetables all at market price. Cienfuegos is prosperous due to a large shrimp fleet, petrochemicals and a thermo electric plant. Now the six hour trip to Havana. To reach the main cross-country six-lane highway from Cienfuegos you traverse a scenic two lane road with many horse-drawn carts amidst tractors and trucks loaded with local residents. No way to make any time, but one does get a sense of the small farms, tourist facilities and large sugar cane fields. In this area of Cuba sugar cane lands are farmed with fairly modern equipment. This is in stark contrast to western Cuba where the small tobacco plots are tended by oxen. Once on the main highway, the traffic is sparse and you can make time. Interesting, all along the highway one would see groups of people hitch hiking. You’ll see el amarillo, the “yellow man,” a state employee who is empowered to flag down any vehicle with a government plate; certain vehicles are required to pick up travelers by law as there is no organized inter-city transportation. Other travelers choose to wave money to entice a ride in a private vehicle. Again, more box trucks loaded with travelers. Havana is the grand dame of the Caribbean! But she has been a more than a bit down on her luck. This once elegant and prosperous capital shows the effects of the revolutionary government. Although many buildings have and are being restored, once one gets into the side streets you can see there much work ahead. Residents can purchase their individual flats, but the government is supposed to maintain the building exteriors. There is little money for this to date. Even though flats can be owned, there is not yet a building association concept; collecting money to maintain the exterior is not part of the culture. One may have a remodeled flat, but if the roof falls in, one queues up for another apartment from the state. Now, about the vintage American cars. One has to appreciate the mechanical genus that has kept these cars on the road. In the suburbs these “oldies” are used as local taxis and packed with people. With regulations loosening up, people will invest in a car and a driver to capture the tourist dollar (or more correctly, a CUC, the Cuban Convertible Currency). Cuban entrepreneurship at its best! At $20.00 per head they are coining the money. Some of these cars are beautifully restored – others not so much. We rented a ’52 Chevy that had a new Kia engine and a ’53 Chevy with a new Mercedes five-cylinder diesel. Others may even have old Russian tractor engines for power. These vintage cars are so valuable they become family heirlooms to be passed on to the next generation. Havana is a beautiful, vibrant destination city. In our five trips there is always something interesting to see. Travel to Havana is featured almost weekly in articles from many sources, so no point in going into detail here. We’ll just say that there are several beautiful hotels with a few more being constructed in partnership with the Cuban government. On one trip we visited a central planning office as saw a complete scale model of central Havana in the future. Very impressive! What has surprised us is how many more visitors are coming to Havana from all parts of the globe. It has been discovered. We are asked, “is it safe and should we go?” Yes and Yes! U.S. government regulations have been clarified and travel agencies know to meet the regulations. If you go, consider combing your wardrobe for serviceable clothing to go on a one way trip. Many Cubans still have so little. Cuba is definitely worth seeing before it is overrun with more tourists that it can handle. Cubans are very hospitable and love to show off their country. We teach our children to give back. One way has been to take a Polaroid type of camera and ask locals if they would like a photo of themselves. Believe me they do! This is a great ice breaker to start a conversation. This mime enjoyed seeing the success of her look in a Polaroid photo. Tom Maish is a past President of the Friends and currently on the Board as Chair of the BoardWalk Vision Committee. He also serves on the Audubon Corkscrew Swamp Sanctuary Sustainability Board and the Everglades Wetlands Research Park a part of Florida Gulf Coast University.